Though we've survived them before, each deployment is different and raises new challenges for the family. Not only do the missions, rules, and forms of communication vary, but your life at home does, too. You have kids, you change jobs, you move or your friends move, and you realize that each of these variables, although small, affects your life during deployment in a big way. Carlos Perez, Assistant Secretary for America Armed Forces Mutual Aid Association (AAFMAA), served as an Army combat engineer for 26.5 years. He's a husband, father to four, and served three deployments during his time with the Army. His extensive time and knowledge make him an expert, so I turned to him for tips on how to prepare the civilian spouse for a deployment. Attend pre-deployment meetings and learn as much information about the deployment as you can. Obviously, some information is confidential, but strive to find answers like where your service member is going and for how long. Then talk to your spouse about communication. Plan how you’ll reach each other, whether by phone or email, and discuss how often you can expect to hear from one another. 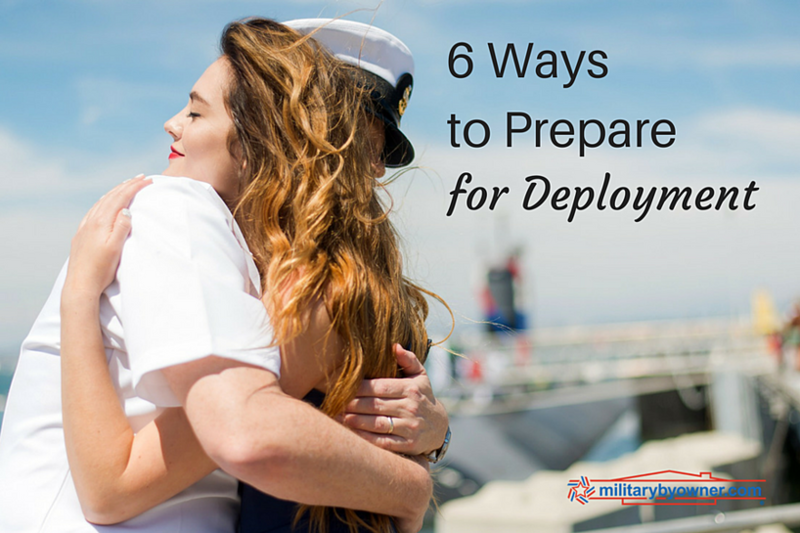 Numerous resources areavailable to support your family when your service member deploys. Connect with the Family Readiness Officer (FRO), who will keep you informed throughout the pre-deployment and deployment process. They’ll provide you with additional resources to support you and your family like Military Kids Connect, which helps kids ages 6 to 17 cope with deployment through online modules and games. Zero to Three and Sesame Street for Military Families are also great resources to support families with kids. In preparation for deployment, take a look at your budget. When your spouse deploys, you can cancel services that are no longer applicable and decide how you want to integrate entitlement pay. Together, decide if you want to pay off debt, save, or invest the additional income and create a new budget accordingly. 4) Verify access to accounts. If you aren’t the primary account holder for utilities, bills, and bank accounts, your service member needs to make you an authorized account manager. Even if your bills are established on auto-pay, if the system fails, you'll need the authority to handle the accounts without relying on your deployed spouse. You can get a Power of Attorney; however, companies aren’t required to accept it, so it’s best to have both a POA and be an account manager. Before your service member deploys, download a password vault where you can document your usernames and passwords in one protected place. This small step will help you not have to depend on reaching your spouse on a ship or in the desert where communication may be scarce. 5) Locate and update important documents. Your family’s sensitive documents like birth certificates, marriage license, and will should be filed in one place. Know where they are and update them as needed. If your will doesn’t include the baby you had last year, make a trip to your legal office and update it. Ask your spouse to look at their Servicemembers Group Life Insurance (SGLI) and DD93 to ensure that you’re listed as the contact person should anything happen to them on deployment. If they last deployed before you were married, the contact person may still be their parents. You may also want to look at the amount of life insurance, in the event that the unthinkable happens. Talk about things like car and house maintenance. How often does the oil need to be changed, and which mechanic do you take it to? If something goes wrong at the house, which handyman do you call? Write down the contact information and keep it with the car and home records you have filed. Deployments take a toll on us emotionally. Sometimes it can feel there's not much we can do to prepare, but start with these six steps to help give confidence and independence to cope.